If you go down to the woods today, you'll want to skip the scenery and jump straight into this video slot game inspired by the famous fairytale. This Goldilocks and the Wild Bears slot will take you all the way back to your childhood. Play Goldilocks and the Wild Bears For Free! If you go down to the woods today, you'll want to skip the scenery and jump straight into this video slot game inspired by the famous fairytale. This Goldilocks and the Wild Bears slot will take you all the way back to your childhood with great graphics and a friendly concept. 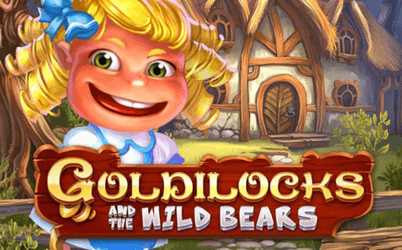 Goldilocks and the Wild Bears is a fun-filled five-reel, 25-payline video slot packed with hand-drawn caricatures of everyone's favourite fairytale characters. It comes from Swedish game developer Quickspin Gaming, who have previously crossed paths with fantasyland in their online video slot Rapunzel’s Tower. This exciting game recasts Goldilocks as a cheeky prankster, and the bears as the dumb targets of her attentions. The bears themselves, four in total including a stuffed toy bear, all give a medium payout, with Daddy Bear offering a slightly higher reward than his kin. Low pay symbols are the classic A, K, Q, J, and 10, presented as colourfully inscribed capitals like those from an old storybook, and there is plenty of other references to the old house full of porridge. All slots have their own unique twist based on their theme, and this game is no different. As mentioned, Goldilocks is portrayed as a prankster, and has her own mini-game where she will start to annoy the three bears in a special mini game. 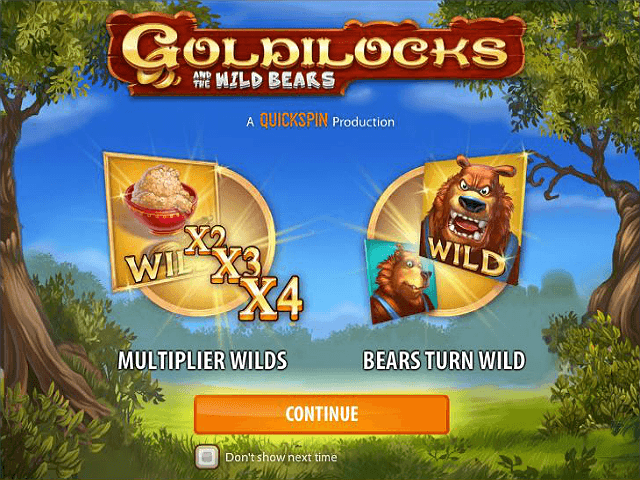 All you have to do is to get three Scatter symbols, portrayed as Goldilocks with a golden spoon, and you will be taken into the wooden house for 10 free spins in the mini game known as ‘Bears Turn Wild’. While the free spins are rolling, the cheeky Goldilocks will appear and start annoying the bears, as well as adding to the count – you can collect a total of 13 for the ultimate profit. When you get three Goldilocks symbols, Papa Bear will go Wild, and can start replacing symbols for extra rewards. He might even give you a scare with his loud roar! Mama Bear has a bit more self-control and you would need to gather five more of the Goldilocks symbols before she go Wild, while the Baby Bear is not fazed at all until Goldilocks has teased them 13 times (this is counted on the Goldilocks bar at the bottom of the reels), which will turn him Wild as well. Goldilocks and the Wild Bears also has a number of bonuses to play for. The infamous perfect bowl of porridge is the multiplier wild, which could potentially increase the total win by up to four times. When they are not multiplying your profits, they act as regular wilds. There is also a full-time dedicated Wild symbol, the bears’ house. This can be substituted for all symbols except the Free Spin bonus. Quickspin is known for developing their games to stand the test of mobile, so why not check out one of our recommended casinos, like Rizk Casino to try this game today!